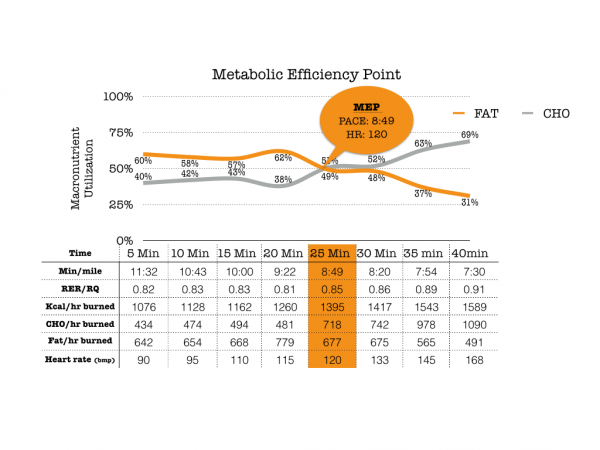 After the last post there were so many questions about the metabolic efficiency testing that it makes sense to share some test results to give you a better idea of what you can gain from the data. 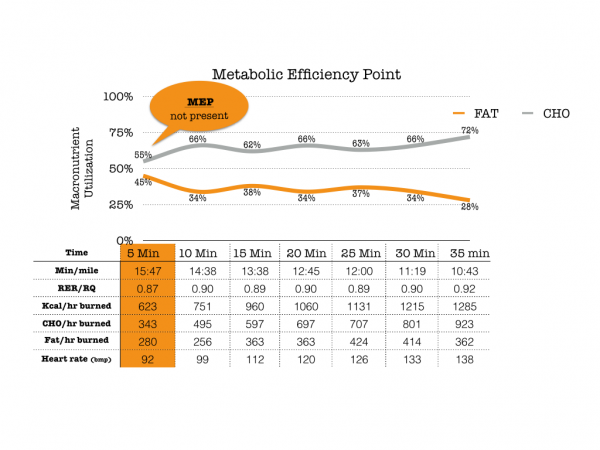 The first thing you will learn is if you have a Metabolic Efficiency Point or not. The MEP is the point at which you cross over to burn more carb calories than fat calories. It was previously believed that you will automatically burn more fat calories (than carb calories) by exercising at lower intensities. 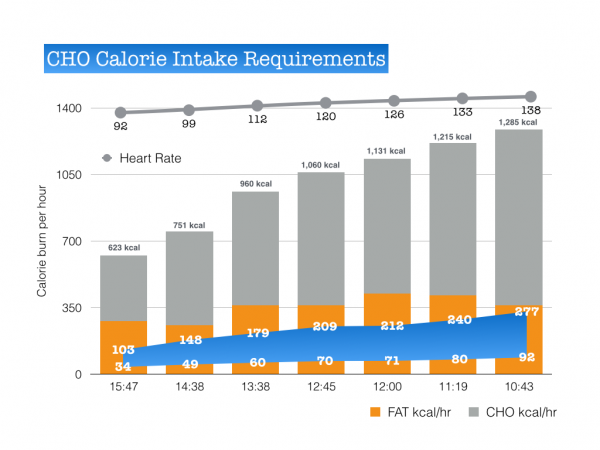 However, for many people, that is not true and in this situation where they burn more carb calories than fat calories at lower intensities, they have no MEP due to inefficiency. For other folks who are very efficient, they can continue to burn a majority of fat calories at race pace intensities. The first chart shows someone that did have a MEP and the second showing someone who does not. 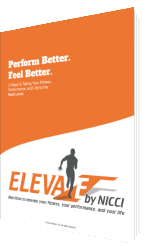 Based on this information the goal for Athlete #1 is to increase the distance between the lines to burn even more fat calories on the left side of the MEP and also to increase the pace at which the cross-over happens. The goal for Athlete #2 is to work at getting a MEP. From there we go into the proper amount of carbohydrate calories needed to be consumed while racing at a given pace, or if necessary during training. Burning a certain amount of calories does not mean you should try to replenish that same amount. There is a range listed on these charts with the goal of performing with the lowest number in the range. 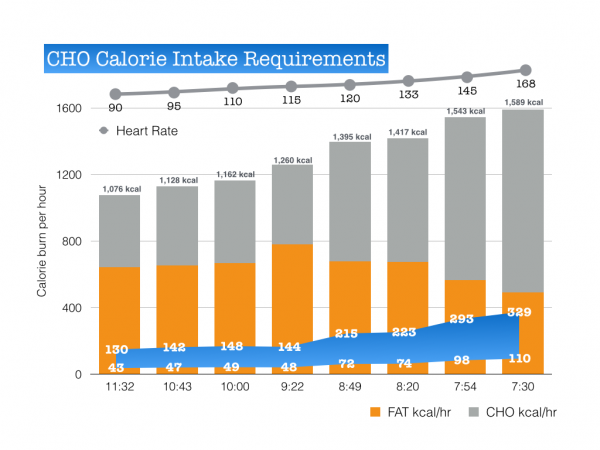 As efficiency increases, these numbers will change and less calories will be required at each pace. 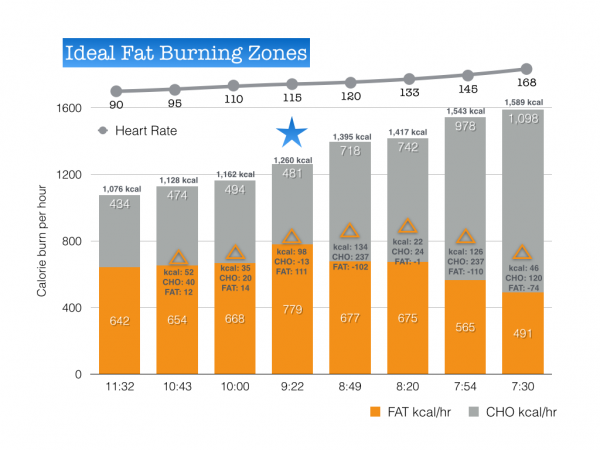 Learning your ideal fat burning zones is the next piece to cover. The developmental zones for burning more fat will always occur at and below the MEP. However, there are additional zones that can be best utilized when training at higher intensities. 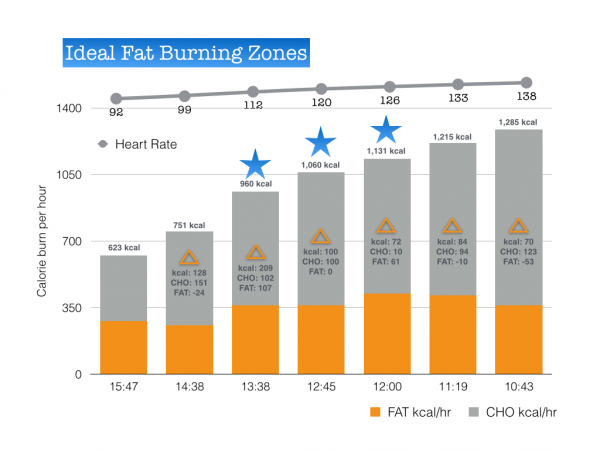 Based on the difference in caloric burn from stage to stage, the stars highlight the highest fat burning zones for these two athletes. This was just a sampling of the information provided. At the end of the interpretation, we go into nutrition and training recommendations and follow that up with education around the implementation of the recommendations. In order to change the MEP, 75% of the equation is related to your daily nutrition and 25% is related to training in your optimal zones. I hope this was helpful for understanding more about the testing results and interpretation. Hope to see you soon!